Moringa oleifera is an essential plant in meeting Global food security and sustain the livelihoods of many millions of people. Climate change provides both opportunities and challenges for attaining the potential contribution of the wonderful tree for sustainable human development. Strategies need to be developed to address key issues in productivity, crop plant-soil/water/energy resources management, and postharvest utilization as food and feed, nutritional and health value addition, and trade and commercialization, so that the role of Moringa in ensuring sustainable development can be enhanced. On realizing the potentiality of moringa as a nutritional security provider and the high value energy crop, much importance is attached to it and this is the right time to gear up for research and development activities to reap its fullest potential. 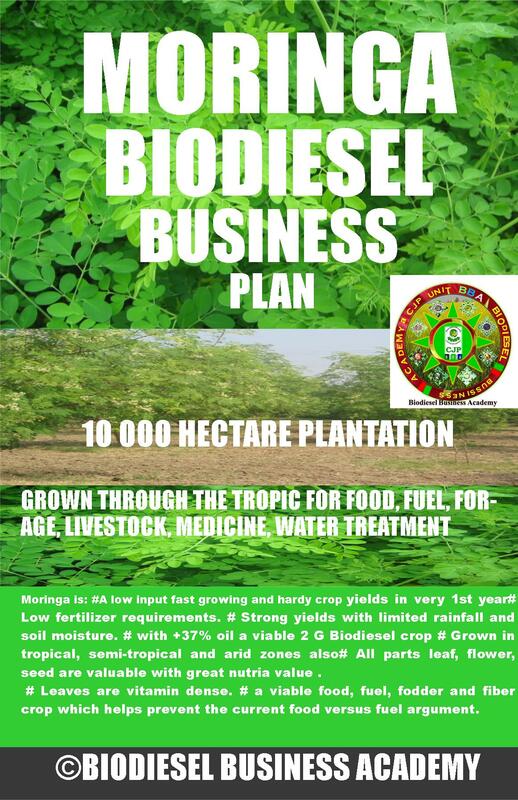 The Biodiesel Business Academy (BBA) announced progress on its work with Moringa Oleifera, a Biodiesel producing shrub that bears valuable oilseeds. According to the BBA, it has developed a micro-cutting mass propagation technique using the plants developed through itsMOMax3™improved seed product line and a set of best practices that will enable high oil yields. BBA included Moringa Oleifera in its research portfolio on the basis of certain solid credentials: a higher recovery and quality of oil than other crops, no direct competition with food crops as it is a edible source of fuel, and no direct competition with existing farmland as can be grown for both purpose same, in year 2009. BBA scientists are continuously working on enhanced genetics, agronomics and horticulture sciences to drive new varieties, more knowledge around the plant’s nutritional requirements and more science-based processes for the care and custody of the plant and have achieved reliable and scalable results in Moringa energy farming. BBA team’s Moringa Oleifera work has resulted in evolution of new variety through scientific selection that will enable highly productive plantations of the crop to be grown. In April this year, a new moringa variety named as MARU-MORINGA was introduced. Maru Moringa: First yield starts in 4 to 6 months after plantation & gives commercial yield up to 10 Years. (Per year two seasons with better uniformity, improved self-branching, early flowering and higher productivity.BBA’s elite Moringa Oleifera variety ‘Maru-Moringa (MOMax3™)’ will yield at maturity as high as 3-4000 liters of oil per hectare, with proper nutrition and irrigation. Through itsMOMax3™ improved seed product line, BBA provides growers the highest yielding, most uniform and profitable Moringa Oleifera in the world. Improved seeds result in greater yield, uniformity and vigor while significantly reducing Plantation costs for growers.MOMax3™improved varieties have been tested and developed for a range of climatic and soil conditions. BBA's proprietary technology for the mass production of Moringa Oleifera plants from mini-cuttings obtained from the mother plant raised throughMOMax3™seed enables a significant production increase over traditional propagation methods. · -quickly scales large Moringa Oleifera projects with consistent, high yielding Moringa Oleifera. · -Facilitates production of the large volumes of low-cost crude Moringa Oleifera oil required by major energy, oil and transportation consumers. · -Requires 1/75ththe land needed to produce cloned plants by micro propagation, with the added benefits of HYV vigor, strong roots and overall improved plant health. Globally, about 870 million people do not have enough to eat, and more than two billion suffer from micronutrient deficiency, according to United Nations (UN) food agencies. The Moringa tree is increasingly considered as one of the world's most valuable natural resources, as the main constituents of the tree have several nutritive ingredients. Its leaves, pods and flowers are considered good sources of vitamins A, B, B2, B3, B6 and C, folic acid, ascorbic acid, beta-carotene, calcium, iron, and amino acids. More importantly, its leaves are highly nutritious; being a significant source of beta-carotene, vitamin C, protein, iron and potassium Arial. Moringa oleifera is an essential plant in meeting global food security and sustain the livelihoods of many millions of people. Moringa has attracted attention as pressure mounts to find sustainable alternative fuels to help meet countries' renewable energy targets and cut greenhouse gas emissions, without interfering with agricultural production. Researchers at BBA has honor to establish this untapped resource as alternative source for Bio- Diesel industry of future as Moringa is a strong candidate to contribute significant amounts of biofuel feedstock. With its extensive experiences in the field, enhanced technology, plant science & professional knowledge, effective consulting service and business intelligence BBA can clearly understand the business model, products and services, production, marketing and provides all aspects of feasibility analysis and business development including assessments of the following: crop production, crushing, co-product markets, feedstock acquisition and contracting, technology analysis, risk analysis specific to biodiesel technology, feedstock, markets, and general project risks, market and financial analysis. We make the integration of our experience and professional knowledge with your information. We provide in depth analysis of crop cultivation and crop care part of plan for which we have team of agronomist and plant scientists, and then we have engineers and experts in biodiesel industries to finish the technology and production part of business plan. We have professionals in accounting to complete financial and economics part. BBA can offer the type of consulting that only numerous years of leadership in the biodiesel market can provide at an affordable price. BBA estimates the key financial figures for a company’s Moringa Project over 5 years. Th3e projections include abbreviated income and cash flow statements and a balance sheet.